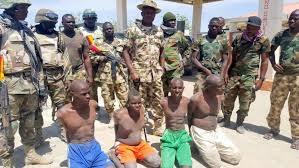 Troops of Operation Lafiya Dole have arrested some Boko Haram insurgents. A statement from Colonel Onyema Nwachukwu, Deputy Director Public Relations Theatre Command Operation Lafiya Dole, yesterday, said troops raided Boko Haram hideout in Yerimari Kura, in a deliberate Rescue Operation to extricate and rescue hostages held by insurgents in the hideout. “In the encounter, troops killed three Boko Haram insurgents and captured five. Fifty four women and 95 children held hostage by the insurgents were rescued by the gallant troops. Troops also destroyed several logistics belonging to the insurgents”, he noted. “The rescued hostages are currently receiving medical attention at the 21 Brigade Medical Center and will be profiled after the medical screening session. In another encounter, troops of Operation Lafiya Dole on patrol in Konduga have intercepted and neutralised two suicide bombers, who attempted infiltrating Mandanari Community in Konduga, Borno State. “The two suicide bombers strapped with suicide vests were sneaking into the community at about 8.00 pm, when they were sighted by vigilant troops, who challenged them from a safe distance.